What to do, where to eat & stay on these close-to-home desert adventures. The larger dunes are on the west side of the North Algodones Dunes Wilderness (2.5 hours from San Diego). I typically love the sea, sun and sand. Interestingly though, not all the sands I’m drawn to lie in coastal regions. In fact, most of the sand on Earth is stacked in massive piles in remote areas – rarely in coastal regions, which you might expect. That doesn't stop surfing sufis from hitting the slopes. The Great Sand Dunes National Park and Preserve in Colorado claims the continent’s tallest dune, Star Dune at 750’. This particular dune is estimated to be approximately 12,000 years old, formed by deposits carried down the Rio Grande River canyon. But SoCal’s got its share of sand. Aside from the coastal Oceano Dunes near Pismo Beach, California's dunes are inland. East of El Centro, California’s Algodones Dunes has a high point of 520’. These dunes are easily accessible off Route 8 if you want just a quick peek or a few hours sliding (bring your saucers). However, if you’re jonesing to crest the tallest ridge away from the ATVs, wait for a full moon, grab a backcountry permit at the North Algodones Dune Wilderness Area off RT 78 and start climbing. The Algodones west of El Centro covering 200 square miles is the largest – though not the tallest – dune system in North America. The Imperial Sand Hills National Landmark lies within the Algondones wilderness area. The Chocolate Mountains drain into the dunes, leaving ponds in the springtime. Note, however, that the southern district is open to all terrain vehicles. Naturalists seeking quietude should visit the northern section. The Kelso Dunes (highest dune: 650’) cover a 45-mile area. They lie seven miles south of the Kelso Depot. Sitting in the valley below Death Valley's Last Chance Mountain (4,000'), the Eureka Dunes further north span three miles long with the crest rising 680'. Dunes are constantly in motion, always changing shape and continually growing thanks to the prevailing trade winds. They “creep” day after day, consuming anything in their path. They also collapse in avalanches and sheet flows. The Algodones, for instance, are said to be migrating at the rate of a foot a year. Because they move, some say the sands “sing,” like those at Kelso and Eureka (although only when not damp). Now that’s an experience worth braving the hazards of backcountry camping. 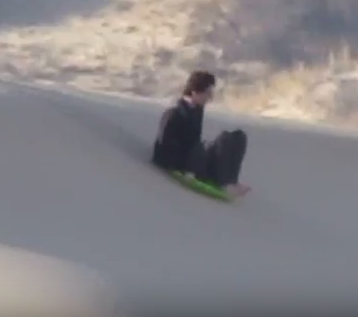 When saucers aren’t quite doing it for you, consider sandboarding. Newbie extreme sporting enthusiasts can rent sandboards and take classes at many of the dunes operated by the National Park Service. Tour guides such as Thrillseekers Unlimited offer sand-surfing packages on Death Valley's 400' Dumont Dunes. Be advised, however, that unlike snowboarding, there are NO lifts to take you to the top of the dunes you wish to ride. 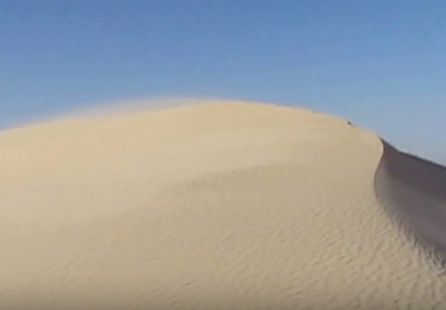 Also, because the dunes are steep, descending board speeds have been clocked in excess of 60 MPH. The closest dunes are the Algodones, a 2.5-hour drive east of San Diego. Take RT 78 east to Glamis. Access the dunes via the Niland/Glarnis County Road. The Kelso Dunes are just under five hours northeast of San Diego in the Mojave Desert, straight up RT 15. Ok, so these places are in the remote desert. If you aren't a hiker/camper, and don't own a trailer, and aren't interested in leasing a RV for the weekend, then here are my suggestions. Although there's the host of normal chain hotels in El Centro, check in at the Barbara Worth Resort and Country Club ($69+) for a room with pastoral view. Whoever thought I'd be sending you to El Centro, right? Alas, it's either that or Yuma. El Centro was once a hot playground for movie stars and the original Barbara Worth Hotel (since destroyed by fire) was a grand dame. If venturing up the highway to Kelso Dunes, the chain hotels and motels in Barstow are your best bet. Not much in the vicinity besides tumbleweed. And dates. The China Ranch Date Farm Inn has rooms in a shaded oasis fed by an artesian hot spring. In Death Valley, Furnace Creek Resort won't disappoint. Besides, it's got the views. There's Panamint Springs for more rustic accommodations. The Exotic Thai Bistro in El Centro – though you'd certainly have your choice of Mexican places. The Kelso Depot is a fun retro diner with killer-fresh berry pie. Just saying. In Barstow, try either Jenny's (Grill Steak and Marscos) on Main St. or Idle Spurs (Steakhouse), a desert icon having been in business over 50 years. The China Ranch Inn has a bakery. Both Furnace Creek and Panamint Springs Resorts have onsite restaurants. Everything else is a drive, Shoshone being your closest town on the eastern entrance. On your way out to the Algondones on RT 8, stop and see the rock effigies at Boulder Park. If taking RT 78, plan to spend time exploring Avery's outdoor sculpture gardens on the Galleta Meadows Estate in Borrego Springs. Definitely visit the museum at the Kelso Depot Visitor's Center for interesting tidbits about the Mojave. Not far from the Kelso Dunes is the Cinder Cone Natural Area, a complex of 20 large cinder cones surrounded by extensive lava flows. Hit that, the Calico Ghost Town and the Lavic Lake volcanic field on your way there. Don't drive through Barstow without stopping in at Mary Colter's Casa del Desierto, a restored "Harvey House" built along old RT 66. If stretching on to Death Valley, veer off the highway to see the Trona Pinacles and the Amargosa Opera House.